Scott Page discusses his new book about how diversity is proven to boost performance. The topic of workplace diversity has vexed businesses and employees for decades. Increasing diversity has long been promoted as the right thing to do, but that notion could be viewed as simplistic and ignoring the deep benefits that inclusion can bring to an organization. 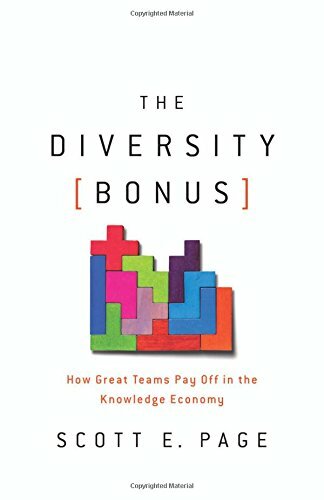 Scott Page, a professor of complex systems at the University of Michigan, tackles the issue in his new book, The Diversity Bonus: How Great Teams Pay Off In The Knowledge Economy. He discussed why diversity must be more than “feel-good metaphorical statements” on the Knowledge@Wharton show, which airs on SiriusXM channel 111. Knowledge@Wharton: What drove you to research this topic? Page: It’s a little bit of a C.P. Snow moment. He was the British academic who said there are two academies: science and arts. Within the University of Michigan or almost any university, you’ve got people in the humanities and in the arts and philosophy departments talking about the need for inclusion on normative grounds, a sort of moral case for a more integrated society. Over in computer science and ecology and business, there are all these people showing in a knowledge economy this incredible value from people who have different perspectives, different ways of looking at problems, different tools. On one side of campus, there’s a whole bunch of people talking about the pragmatic benefits of diversity. On the other side, people are talking about the normative benefits. They weren’t communicating with one another. I saw this as a real opportunity for a fruitful conversation. Knowledge@Wharton: Don’t you think this “right thing to do” mindset about diversity feels a little patronizing? Scott Page: It does in a way. We want our firm to look like America or have people that come from all these different categories, as opposed to asking whether we are bringing in people who can help us fulfill our mission or be better at whatever it is that we do as an organization. Knowledge@Wharton: Are we seeing a significant shift in companies thinking more deeply about diversity in the workplace? Page: I think you’re seeing a real shift as the nature of work changes. One of the tropes I use in the book is: Think about a firm that’s hiring people to do physical labor like chopping down trees. In that world, you can figure out someone’s ability, which is how many trees they can chop down. If you’re hiring 10 people, you should hire the 10 best people, and to not hire someone because of their race or religion or gender would be discrimination. Going back to the civil rights movement, that’s how a lot of this was framed. You shouldn’t discriminate. You should hire the person who has the most ability. Think about Apple: That company generates $2 million in revenue per person. No one in Apple is chopping down any trees; they’re working on really hard problems. As evidence begins to accumulate, it’s becoming clear that you want smart people who think differently, who have been trained differently, went to different schools, have different knowledge bases. The talent of the team depends on having diverse people on that team. This has become something that everyone has started to recognize as more and more data rolls in showing that to be true. You end up with firms recognizing that cognitive diversity is a strategic asset. Knowledge@Wharton: There are concerns that Silicon Valley is not diverse enough in terms of women working at these companies. Diversity isn’t just people of different backgrounds. There’s also gender diversity as well. Page: Right. Identity diversity is a difference in who we are. Cognitive diversity is the difference in how we think. If you’re Apple, if you’re Google, if you’re Amazon, the question is, does identity diversity matter? The evidence shows it matters in four ways. The first is syllogism. If you and I come from different identify groups, we have different knowledge bases. You search different things on the web than I search. We read different books. We have different interests. On some problems, identity diversity correlates with cognitive diversity. It’s also true that if I’m sitting in a room of people who are all trained like me and look like me, I don’t think as hard and don’t feel the need to explain as deeply. Imagine you’re designing a building and put a blind person on your team. You’re going to think about the building entirely differently just because that person is in the room. Or if you put a physically disabled person in the room. Just being around difference, that’s the second thing. The third one is the things we see as problems vary depending on our identity. Where we want to devote our energies is a function. Having more people from different identity groups in the room just leads to more possibilities, and that is well-documented. The fourth thing, and I think this is the one that people miss, is that all these women who are not in tech because they just don’t feel comfortable there, or people of color who are not in tech because the culture just doesn’t fit, you’re not only missing out on talent, but you’re also missing out on diversity. Because when you make the pool bigger, you’re just going to get more diversity. Even if women work differently than men, just by having a larger pool, you’d have more diversity. Knowledge@Wharton: You’re looking at the benefits, but diversity can backfire on companies that don’t commit to a meaningful policy. Page: Absolutely. If you think of how a consulting company comes in and does an evaluation, they’ll ask, how does this affect people? How does it affect process in terms of the organization? Is there risk? How are competitors responding on a list of dimensions with which you evaluate a business decision? If you don’t bring a lot of diverse lenses to bear, you’re likely to have blind spots and make mistakes. What I’m trying to do with the book is speak math and logic to metaphor. You know how people say, “Oh, diverse perspectives are useful,” and that sounds like a reasonable thing? You want to ask, what do you mean by diverse perspectives? And what types of perspective are useful? You want this to move in the direction of science and away from feel-good metaphorical statements about different people being in the room. Knowledge@Wharton: There is a trend of companies wanting to build teams. The days of giving a project to one person and having it done a month later are going away, so the need to have different ideas is more important than ever. Page: That’s exactly right, and the reason why is because everything is so connected now. When I think about any sort of business policy, there’s an environmental effect, there’s an energy effect, there’s a personnel effect. No one’s going to have the bandwidth to think of all the dimensions to a problem. What you see within universities and within organizations is this rise of team-based work. The effective teams have to be diverse when the problem is hard. One of the things I play within the book is what I call the opposite proverbs problem. It’s like anything your grandfather said, your grandmother said the opposite. A stitch in time saves nine. He who hesitates is lost. Too many cooks spoil the broth. Two heads are better than one. It’s not the case that you always want a team. But firms are figuring out that where you need teams are on high-dimensional, complex problems. I’m a professor of complex systems. When I look at complexity, whether I look at ecosystems or engineered systems, I realize the way to cope with complexity is through diversity. The right way to harness that complexity is through diversity. Not all diversity. Don’t turn that dial all the way to 11. There’s an appropriate amount and an appropriate type. I think firms have seized the new challenge: Who should be in the room and how do we get the right people in the room, interacting in the right ways, to lead us to innovative, new ideas and products? Knowledge@Wharton: You could take this philosophy well beyond the company and put it into society. Page: Absolutely. The reason the book is called The Diversity Bonus is that it’s not a marketing ploy, it literally is a bonus. One of the most amazing pieces of research that I talk about in the book is a study that looked at 28,000 predictions by economists over a 40-year period. The best economist is 10% better than a random economist. If you average the best economist with the second-best economist, who is 9% better, you get 18% better. Bringing somebody in who is demonstrably worse makes you better because of the fact that they’re different. There literally is a bonus. It’s not marketing. It’s math. Knowledge@Wharton: That’s why the more perspectives you can bring to a problem, the greater the potential benefit. Page: With one caveat: They’ve got to be good. This is the challenge, the deep paradox that lies in this sort of logic. If it were possible to create 100 ways of looking at a problem that were all good and diverse, we could nail everything. Therefore, it’s got to be impossible to do because these things are just not predictable. But the point is, typically two is better than one, and three is probably better than two. You may not want to have 15 different ways because you might not be able to provide fuel for 15 reasonable ways of looking at a problem. Knowledge@Wharton: How does all this apply specifically to the knowledge economy? Sometimes you place your bets, you take your chances, and things are going to work out or not work out. Other times, you just completely forget to look at a particular dimension and realize next time we make this decision, we’re going to have someone from the unions in the room. Or next time we make this decision, we’re going to have someone who knows logistics in the room. You want to make sure that you’ve got the right level of diversity to cover all the bases. Knowledge@Wharton: Workplace culture is also a factor in the success of diversity, correct? Page: Ten years ago, I wrote a book called The Difference, which is kind of a mathematical book about the role of diversity in complex systems. Because of that book, I got invited to a lot of high tech firms, including Boeing, Yahoo, Google, Ford and NASA, to talk about the mathematics of diversity and things like random forced algorithms — really geeky stuff. You go into those places, and you’re like, “Oh my gosh, every one of them is so different.” There’s the famous David Foster Wallace quote where there’s two goldfish swimming in the water and an older goldfish comes up and says, “Morning, boys. How’s the water?” They’re kind of confused. He swims off. Then one says to the other, “What the hell is water?” You go into these firms, and it’s like the water is different in every place. One of the things that’s so important is making sure that you have a culture where people feel comfortable sharing their diverse ways of thinking. If you look back at the O-ring disaster with NASA, that’s a case of a culture where people didn’t share what they know. Knowledge@Wharton: In the book, you link diversity to the U.S. Supreme Court and some of the decisions by Justice Antonin Scalia. Page: There was a famous Supreme Court case, Grutter vs. Bollinger, involving the University of Michigan, where Scalia says Michigan has a choice. You can be diverse or you can be excellent. I think “super-duper” is the phrasing that he used. So, it’s a choice between super-duperness or diversity. If we were admitting students and they were going to go chop wood, he’d be exactly right. My point is not that Scalia is wrong. My point is that there are places where Scalia is right, namely chopping wood, but there are other cases where Scalia is not right, and that involves almost anything that’s complex. The fact is, if we really want to be super-duper on complex problems, we have to be diverse. There’s no trade-off. I think Scalia was kind of pernicious about it. We get back to your earlier comment that it seems patronizing. Well, we’re including some diverse people because we want to do the right thing here. If I really wanted to figure out obesity or the opioid epidemic or inequality, or write a health care plan, the idea that I wouldn’t be bringing people of every race and both genders from different reaches of the country just doesn’t pass the sniff test.